with H.O. Havermeyer, New York. B. Fredericksen and F. Zeri, Census of Pre-Nineteenth Century Italian Paintings in North American Public Collections, Cambridge (MA), 1972, pp. 199 and 516, as Studio of Jacopo Tintoretto. P. Rossi, Jacopo Tintoretto, I, I Ritratti, Venice, 1974, pp. 48, 75,103, 113 and 153, and fig. 104, as Jacopo Tintoretto. R. Palluchini and P. Rossi, Tintoretto: Le opere sacre e profane, Milan, 1982, I, p. 57, 'potrebbe trattarsi di una replica'. With the election of Girolamo Priuli to the position of Doge the task of official portraitist passed from Titian to Tintoretto, according to Pallucchini (loc. cit.). 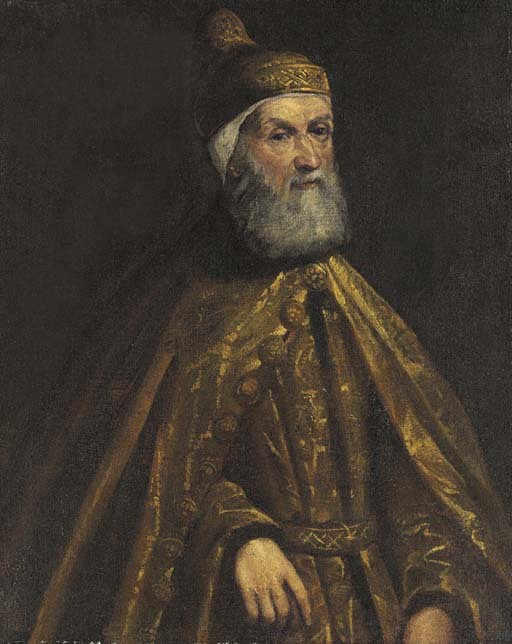 Replacing his brother Lorenzo, Girolamo Priuli was elected Doge on November 25, 1560. In contrast to Lorenzo, Girolamo conducted commerce with the East and gained advantages which enabled him to erect for himself and his brother the sumptuous mausoleum at San Salvatore. The present work is one of a number of versions after a lost original by Tintoretto (see Palluchini-Rossi, loc. cit. ), including one in the Gallerie dell'Accademia, Venice and another formerly in the J. Paul Getty Museum (sold, Christie's, New York, 21 May 1992, lot 35, $30,000). H.O. Havemeyer Sale, American Art Association, Anderson Galleries, New York, 10 April 1930, lot 113, as 'Tiziano Vecelli'. Raleigh, North Carolina Museum of Art, Valentiner Memorial Exhibition, 7 April - 17 May 1959, no.TL.59.1.15.